PS e.max is developed by Ivoclar Dental. It provides not only strength but also a beautiful esthetic result. It can bond to the tooth structure and provides excellent retention because its thermal expansion coefficient is very similar that of dentine which prevents micro leakage. Please also refer to http://www.ivoclarvivadent.us/emaxchangeseverything/lithium-disilicate/index.php for more information. 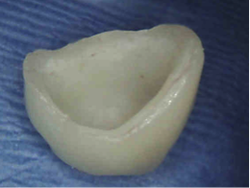 Pictured above: E.max crown inserted onto tooth #10 with a suitable and pleasing appearance in color and form.